Pre-Trips - Saturday & Sunday prior to our "Adventure"
A detailed itinerary for our historic Pre-Trips for Saturday & Sunday will be provided as we get closer to our adventure (all meals included). [gallery ids="6400,6399,6398"] After breakfast on Saturday, we'll carpool from the Franklin Hotel in Deadwood, SD to the iconic Devil's Tower in Wyoming. 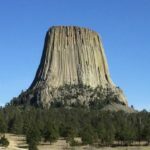 Devils Tower (also Bear Lodge Butte) is a laccolithic butte composed of igneous rock in the Bear Lodge Mountains (part of the Black Hills) near Hulett and Sundance in Crook County, northeastern Wyoming, above the Belle Fourche River. 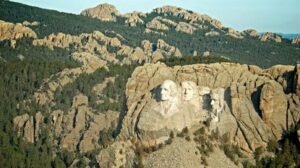 It rises dramatically 1,267 feet above the Belle Fourche River, standing 867 feet from summit to base. The summit is 5,112 feet above sea level. Devils Tower was the first declared United States National Monument, established on September 24, 1906, by President Theodore Roosevelt. The monument's boundary encloses an area of 1,347 acres (545 ha). In recent years, about 1% of the monument's 400,000 annual visitors climb Devils Tower, mostly using traditional climbing techniques. Hint: we won't do this!! According to the Native American tribes of the Kiowa and Lakota, a group of girls went out to play and were spotted by several giant bears, who began to chase them. In an effort to escape the bears, the girls climbed atop a rock, fell to their knees, and prayed to the Great Spirit to save them. Hearing their prayers, the Great Spirit made the rock rise from the ground towards the heavens so that the bears could not reach the girls. The bears, in an effort to climb the rock, left deep claw marks in the sides, which had become too steep to climb. Those are the marks which appear today on the sides of Devils Tower. When the girls reached the sky, they were turned into the stars of the Pleiades. The first documented Caucasian visitors were several members of Captain William F. Raynolds' 1859 expedition to Yellowstone. Sixteen years later, Colonel Richard I. Dodge escorted an Office of Indian Affairs scientific survey party to the massive rock formation and coined the name Devils Tower. 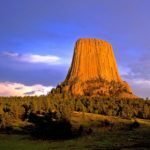 Recognizing its unique characteristics, the United States Congress designated the area a U.S. forest reserve in 1892 and in 1906 Devils Tower became the nation's first National Monument. After lunch, with time permitting, we'll take in a few museums as we head back to Deadwood for our evenings entertainment. 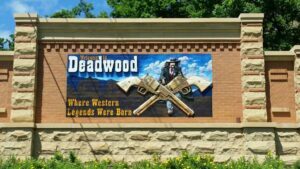 Saturday afternoon, we'll visit several of Deadwood's Museums (see itinerary below), witness Calamity Jane's "True Tales" and "The Shootout", have dinner and watch "The Boone May/Prescott Web Alternation. We'll witness the historic "Capture of Jack McCall" and attend The Dover Brothers Pre-Trial Old-Thyme Musical Show, followed by The Trial of Jack McCall. A busy day taking in as much history of the area as possible. After breakfast, we are scheduled to take in quite a few museums, a few scheduled with special tours. Lunch (included) at The Lodge at Deadwood. We'll return in plenty of time to change into our finest for dinner. There will be a Wild Bill Hickok & Calamity Jane Costume Contest at the Saloon #10 immediately after dinner. This event was well received by all last year (2018) and the costuming was fantastic... if you are into this sort of thing... and most of us are!! Hint: Think the HBO series "Deadwood" or Jeff Bridges in "Wild Bill." Historically accurate interpretations also welcome! Of course, on Tuesday night we will also feature a "Buckskin & Fringe" Costume Contest after dinner - another big success! 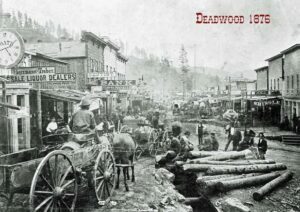 [gallery size="medium" ids="5777,5779,5778"] Dubbed Deadwood after the dead trees stumbled upon in the gulch where miners decided to encamp; it swiftly became the country’s Holy Grail of gold rushes in the 1870’s. And promptly earned its reputation as one of the most violent, harshest, rowdiest and most profitable boom-towns of the era. Why wouldn’t such a recognizable-sounding old west town – backed by an excellent and never-to-be-forgotten HBO series - beckon Great American Adventure riders? It’s no different than the tony town of Tombstone and its dozen of films… this is just our game! The entire city is a National Historic Landmark District for its well-preserved Gold Rush-era architecture. 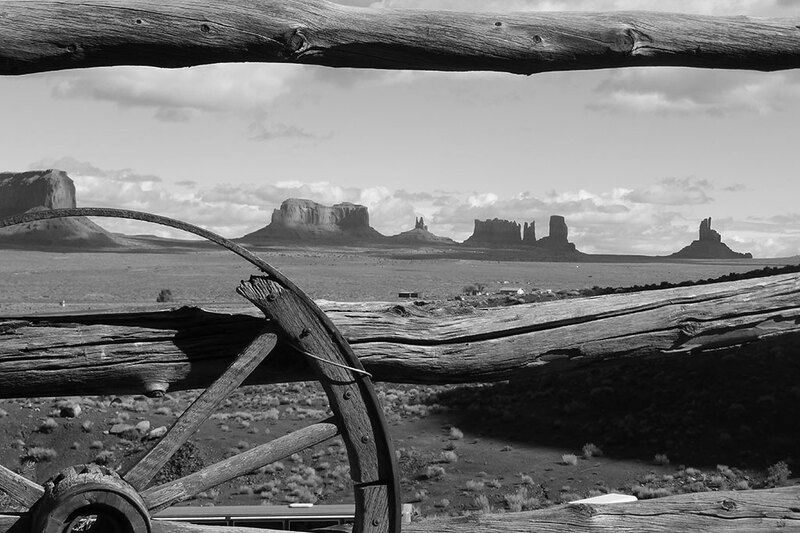 Wild West history abounds… and the city embraces its past with a wonderful plethora of well-maintained buildings, first-rate museums, Victorian-era hotels, fine eateries and mine tours to captivate us during our visit. And yeah… there is gambling and drinking too. In fact, we’ll headquarter at the richly-ornate, Victorian-era historic Franklin Hotel for our three night stay in Deadwood (Sunday, Monday and Tuesday nights). This puts us in walking distance of the finest restaurants, saloons and casinos in town. We'll ride the beautiful trails surrounding historic Fort Meade, near Sturgis, named in honor of Major George M. Meade, of Civil War fame. 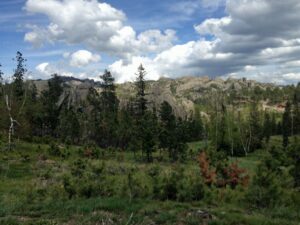 The fort was established in 1878 as a cavalry fort to protect new settlements in the northern Black Hills, especially the gold mining area around Deadwood. Units stationed here included the 7th Cavalry (after the Little Bighorn Battle), the Buffalo Soldiers of the Twenty-fifth Infantry, and the 4th U.S. Cavalry. Fort Meade was preceded by Camp Sturgis in August, 1876, by order of General Sheridan, and named in honor of Lt. Jack Sturgis, who fought and fell with Custer at the Little Bighorn. It was here that the horse Comanche, who survived the Battle of the Little Bighorn, was brought by the 7th Regiment. 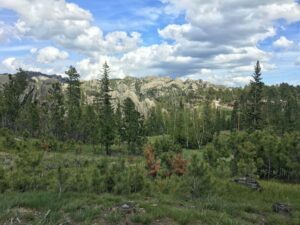 Our ride to nearby Spearfish Canyon was chosen for its Aspen covered hill sides, waterfalls and breathtaking limestone palisades. 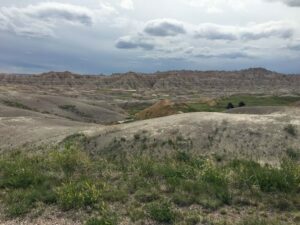 Rich in scenic beauty, we'll see first-hand why several scenes from Dances with Wolves were filmed here. After our day ride we’ll dine at the stunning Spearfish Canyon Lodge. 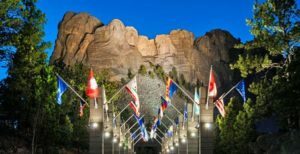 [gallery size="medium" ids="5783,5782,5781"] We have been invited by Mount Rushmore for a sumptuous dinner after our day ride, followed by the lighting ceremony of Mount Rushmore at dusk. A must see! There will be a special tribute to military active and veterans... many in our group were honored as military veterans. 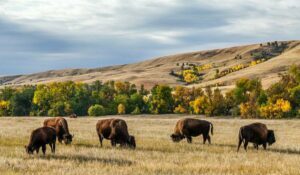 [gallery size="medium" ids="5786,5785,5787"] South Dakota’s largest and first state park and wildlife reserve, named after Lt. Colonel George Armstrong Custer. This will be our new headquarters for the reminder of the week, just outside the west gate. I love everything buffalo. 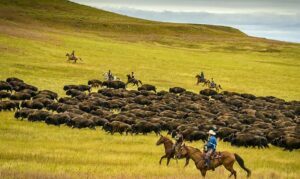 Motivated by the films Dances with Wolves and Lonesome Dove, I not only want to see them; I want to ride among them… at a safe distance of course. 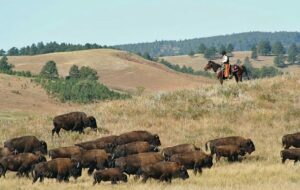 There are about 1,500 free-roaming buffalo on the park, we surely can’t miss them! Heck, we almost hit a huge buffalo driving home from the park one evening after dinner while putting this ride together. Did I say dining? Our dinners for our two nights in the park will be top-notch and delicious. Obviously, we pre-tripped this ride and had a ball doing it. Our first year (2018) of this ride, we rode within 20 yards of the massive buffalo herd. For whatever reason, it was emotional and spiritual for the entire group. We slowly rode through the herd, with thoughts of Gus McCrae from the Lonesome Dove film doing the same. Awesome is the best adjective to use to describe the day. Also See: Travel Insurance – this is strongly recommended. Though not mandatory, dressing in “period-clothing” makes these rides more fun, more adventurous, and makes for great photos ops!! Try it! Don’t spend lots of money unless you want to… I make several recommendations on the Dress Code site where to purchase these items. 5:45 PM - Calamity Jane's "True Tales"
7:35 PM - The "Capture of Jack McCall"
3:30 PM - Arrive back at Franklin Hotel to freshen up for dinner and costume contests. 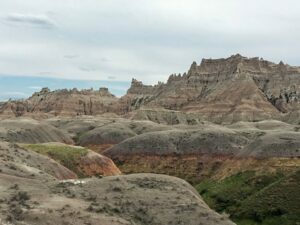 We are scheduled to ride historic Fort Meade; Spearfish Canyon where Dances with Wolves finale was filmed; Custer State Park and the Badlands. While we understand that it may be early to be making travel plans, Custer State Park Resort's accommodations book very quickly. Outside of the Park, options are limited, and you can expect a drive time of 20 minutes or more from our group’s location. We have set up a block of rooms that will be released on Monday, January 14, 2019. If you are at all interested in reserving a room on site, the Lodge recommends that you call and make your reservations as soon as possible so that you have the best possible chance of getting a room and room type that works for you. Call 1-888-875-0001 to make your reservations and reference the Great American Adventures at the State Game Lodge when calling. If there are no rooms in the block that suit your needs, you can ask what is available outside of the block, instead. Be prepared to charge the first and last night’s deposit when making your reservation. If you do have to cancel, this deposit is refundable less a $25 cancellation fee if you do so at least 15 days in advance. 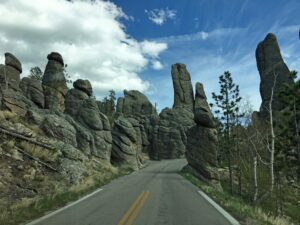 After breakfast on Saturday, we’ll carpool from the Franklin Hotel in Deadwood, SD to the iconic Devil’s Tower in Wyoming. Devils Tower (also Bear Lodge Butte) is a laccolithic butte composed of igneous rock in the Bear Lodge Mountains (part of the Black Hills) near Hulett and Sundance in Crook County, northeastern Wyoming, above the Belle Fourche River. 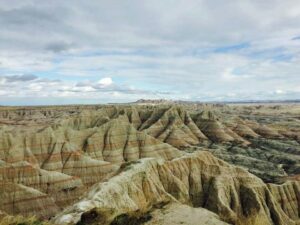 It rises dramatically 1,267 feet above the Belle Fourche River, standing 867 feet from summit to base. The summit is 5,112 feet above sea level. In recent years, about 1% of the monument’s 400,000 annual visitors climb Devils Tower, mostly using traditional climbing techniques. Hint: we won’t do this!! According to the Native American tribes of the Kiowa and Lakota, a group of girls went out to play and were spotted by several giant bears, who began to chase them. In an effort to escape the bears, the girls climbed atop a rock, fell to their knees, and prayed to the Great Spirit to save them. Hearing their prayers, the Great Spirit made the rock rise from the ground towards the heavens so that the bears could not reach the girls. The bears, in an effort to climb the rock, left deep claw marks in the sides, which had become too steep to climb. Those are the marks which appear today on the sides of Devils Tower. When the girls reached the sky, they were turned into the stars of the Pleiades. The first documented Caucasian visitors were several members of Captain William F. Raynolds’ 1859 expedition to Yellowstone. Sixteen years later, Colonel Richard I. Dodge escorted an Office of Indian Affairs scientific survey party to the massive rock formation and coined the name Devils Tower. 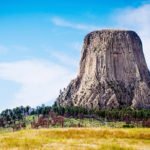 Recognizing its unique characteristics, the United States Congress designated the area a U.S. forest reserve in 1892 and in 1906 Devils Tower became the nation’s first National Monument. After lunch, with time permitting, we’ll take in a few museums as we head back to Deadwood for our evenings entertainment. 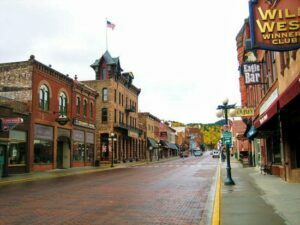 Saturday afternoon, we’ll visit several of Deadwood’s Museums (see itinerary below), witness Calamity Jane’s “True Tales” and “The Shootout”, have dinner and watch “The Boone May/Prescott Web Alternation. We’ll witness the historic “Capture of Jack McCall” and attend The Dover Brothers Pre-Trial Old-Thyme Musical Show, followed by The Trial of Jack McCall. A busy day taking in as much history of the area as possible. After breakfast, we are scheduled to take in quite a few museums, a few scheduled with special tours. Lunch (included) at The Lodge at Deadwood. We’ll return in plenty of time to change into our finest for dinner. There will be a Wild Bill Hickok & Calamity Jane Costume Contest at the Saloon #10 immediately after dinner. This event was well received by all last year (2018) and the costuming was fantastic… if you are into this sort of thing… and most of us are!! Hint: Think the HBO series “Deadwood” or Jeff Bridges in “Wild Bill.” Historically accurate interpretations also welcome! Of course, on Tuesday night we will also feature a “Buckskin & Fringe” Costume Contest after dinner – another big success! 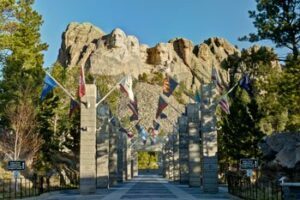 We have been invited by Mount Rushmore for a sumptuous dinner after our day ride, followed by the lighting ceremony of Mount Rushmore at dusk. A must see! There will be a special tribute to military active and veterans… many in our group were honored as military veterans. Our first year (2018) of this ride, we rode within 20 yards of the massive buffalo herd. For whatever reason, it was emotional and spiritual for the entire group. We slowly rode through the herd, with thoughts of Gus McCrae from the Lonesome Dove film doing the same. Awesome is the best adjective to use to describe the day. 3:30 PM – Arrive back at Franklin Hotel to freshen up for dinner and costume contests. While we understand that it may be early to be making travel plans, Custer State Park Resort’s accommodations book very quickly. Outside of the Park, options are limited, and you can expect a drive time of 20 minutes or more from our group’s location. We have set up a block of rooms that will be released on Monday, January 14, 2019. If you are at all interested in reserving a room on site, the Lodge recommends that you call and make your reservations as soon as possible so that you have the best possible chance of getting a room and room type that works for you. Call 1-888-875-0001 to make your reservations and reference the Great American Adventures at the State Game Lodge when calling. If there are no rooms in the block that suit your needs, you can ask what is available outside of the block, instead. Be prepared to charge the first and last night’s deposit when making your reservation. If you do have to cancel, this deposit is refundable less a $25 cancellation fee if you do so at least 15 days in advance.